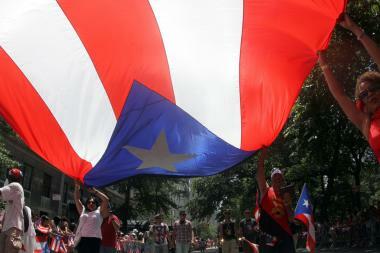 Carrying a huge flag at the 56th annual National Puerto Rican Day Parade on Fifth Avenue June 9, 2013. MANHATTAN — A former leader of a group implicated in the 1975 bombing at Fraunces Tavern that killed four people will no longer be honored at this year’s Puerto Rican Day Parade, Mayor Bill de Blasio said Thursday. Organizers had planned to celebrate 74-year-old Oscar López Rivera as a “National Freedom Hero” during the June 11 parade, prompting organizations including the NYPD Hispanic Society and the Patrolmen's Benevolent Association and companies ranging from JetBlue to the Yankees to boycott the event. But in a statement released late Thursday, the mayor said Rivera — who spent 35 years in prison before President Barack Obama commuted his sentence in January — would no longer be formally recognized at the parade. “Unfortunately, the parade and the plight of Puerto Rico have been overshadowed by needless controversy,” de Blasio's statement read. “Oscar López Rivera agreeing to step aside from any formal role in the parade is a critical step forward in refocusing our city’s attention on the more important issues facing Puerto Rico." The news, however, wasn't enough to sway former parade sponsors AT&T and Goya, who said Friday said they still wouldn't be participating in the event. “I will be on Fifth Ave. not as your honoree but as a humble Puerto Rican and grandfather who at 74 continues to be committed to helping raise awareness about the fiscal, health care and human rights crisis Puerto Rico is facing at this historic juncture,” he wrote. A spokesman for the parade told the Post that organizers “respect [Rivera’s] decision” to decline the honor. The parade’s organizers and Rivera’s attorney did not immediately respond to requests for comment Friday.